In many ways, the health of the housing recovery hinges on credit – a major factor in the well-known housing collapse of a few years ago As banks and other mortgage lender tighten standards and clean up their lending practices in the aftermath of the crash, they’re taking a harder look at the creditworthiness of potential home buyers. But at the sane tune, many lenders are treating credit problems caused by foreclosure as a special case, and one that can be worked around in the interest of closing a mortgage deal. Easy credit to unprepared buyers fueled the housing collapse in key ways. As the hosing market heated up, lenders began offering loans at low or even no interest rates to “subprime” buyers – those with riskier credit histories and unstable incomes. Then those buyers fell into default at massive rates, triggering the landslide of foreclosures, short sales and mortgage fraud that characterized the collapse. But now, as the market improves and interest rates continue low, lenders are taking another look at credit problems stemming from the collapse. For many former homeowners, the impact of a foreclosure or short sale on the credit report may not be as severe as they expect. Here’s why. Tighter lending standards, even with current low rates, continue to keep large numbers of potential homebuyers from being approved for mortgages. A less than robust job market, crushing student debt for younger buyers, and overall mismanagement of credit are factors that either disqualify loan applicants or deter people from even applying at all. That’s why lenders are taking another look at those previous homeowners. For most credit reporting systems, “bad” information about things such as defaulted payments, charge-offs and other credit problems stay on a borrower’s record for approximately seven years – a term that many foreclosure victims are meeting now. So, some banks are extending a hand to those borrowers again, as long as the foreclosure is the only blot on an otherwise generally good report. 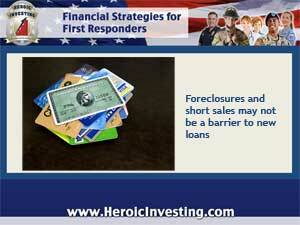 When a foreclosure is reported, the past due amount is also reported. In a short sale, the sale may mark the discharge of the debt. In some states, the balance outstanding is forgiven when a short sale is closed and no due amount appears on the credit report. In others, though, the difference between the amount received in a short stale and the actual loan amount is treated like a separate debt owed.